2. I really need to clean G’s fingerprints off the mirror in her room. 3. I’m need to learn poses that work for me and my new post-baby body. 4. Maybe I should put a decent camera on my birthday wishlist . . . This is another one where I have no idea what brand it is. It’s on “long term loan” from a dancer friend of mine. I borrowed it from her to wear as a costume when we did a show together a couple years ago. (Claire – if you are reading this and want your dress back, please let me know.) 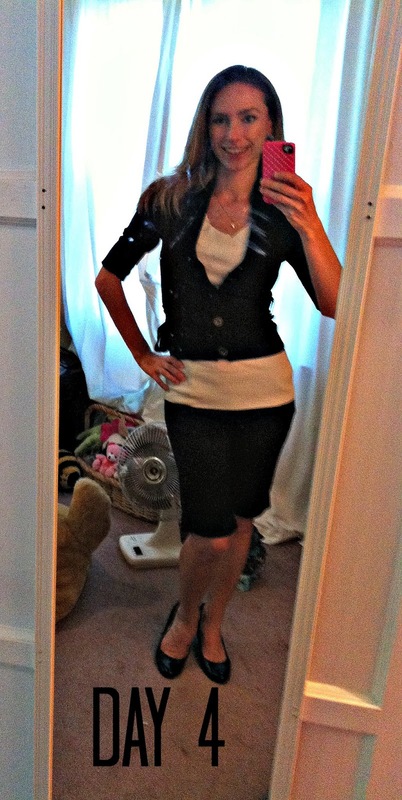 I paired it with a black cami and some leggings for modesty bc I wore it to work today. I also wore my flats from Payless. I LOVE these shoes so much! I’ve had flats before and could never get them to stay on my feet, but these ones have a bit of elastic in them so they actually stay on my feet all day without giving me blisters. I had actually planned on wearing my khaki shorts, but a squirmy little miss G decided to kick my hands as I was changing her diaper, thus spilling coconut oil everywhere – including all over my shorts. So I had to change. And I realize now that the only other bottoms that really go with this turquoise shirt are these jeans. 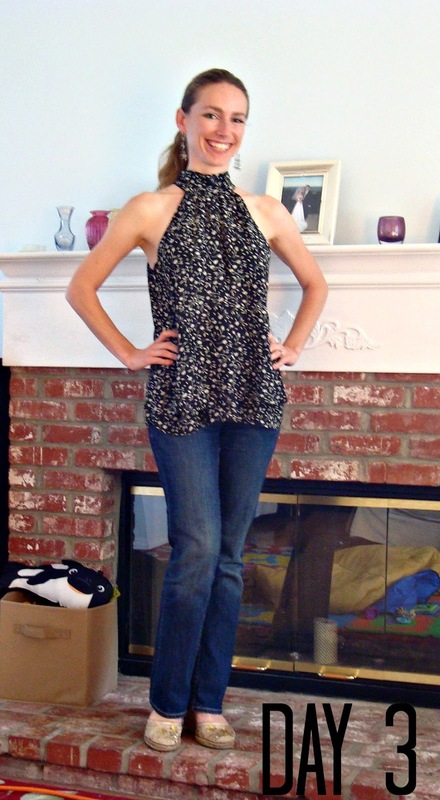 I call these jeans myFelicia Day Jeans bc one of my really good friends has worked with Felicia for a long time now and I guess Felicia was cleaning out her closet and gave my friend a bunch of clothes she didn’t want anymore. 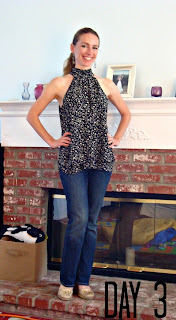 The jeans didn’t quite fit my friend, but they fit me perfectly! I have NO idea what brand they are. All I know is that I love these jeans and will wear them until they are full of holes. 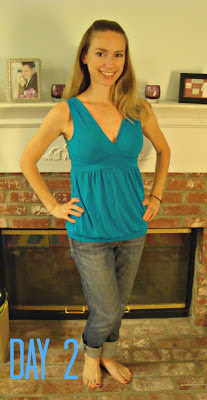 I was going to a Cinco de Mayo party at Adam Carolla’s house, so I knew I wanted something stylish, but not “trying to hard.” Originally I had planned to wear my pink Old Navy sundress, which seemed like the perfect thing to wear to an afternoon party in Malibu. Unfortunately, the weather decided not to cooperate with my fashion plans. So I had to find something with pants that could work (this may screw me over for the rest of the week, actually). But I got several compliments on my outfit, and think I looked appropriate for rubbing elbows with the likes of Ron Jeremy and Howie Mandel (random assortment of people, I know!). I have a really good friend who used to go shopping ALL the time. When she got bored with her clothes, she would give them to me, since we were the same size. I had no problem being on the receiving end of this relationship. J Both these shorts and the shirt were hand me downs from my friend. What I love about these shorts (and that you can’t see in the pic – next time I wear them, I’ll try to get a close up of the shorts) is that they button where the pockets are instead of in the usual fly area. I always feel like I should be going on a boat in these shorts or something, but they are also totally appropriate for my casual work environment. I woke up this morning and it was pouring rain! Who would have anticipated rain in May in Southern California?! Glad I thought to include at least one warm-ish thing! I bought this sweater at Target while looking for a sweater to wear to an “ugly sweater” party at work. I couldn’t help myself, the sweater was super cute! 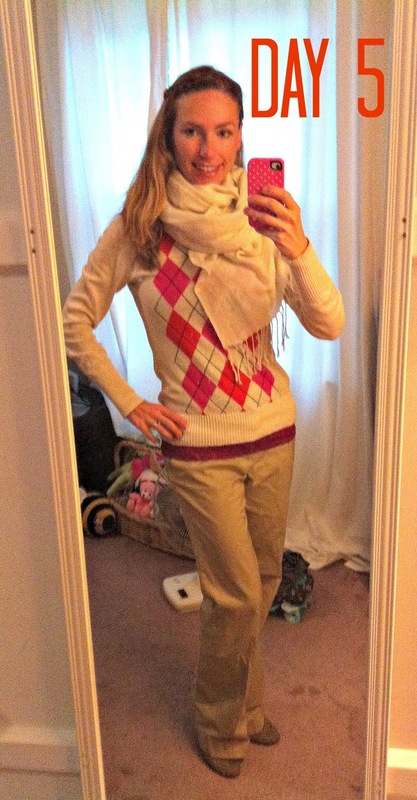 The khaki pants are from Old Navy and were purchased right before I returned to work from maternity leave. They are a little big now that I’ve lost all my baby weight, but they’re relatively comfortable, so I’m keeping them in my rotation. I had to go to a concert at the Roxy with work this evening, so I needed something that would transition relatively well from day to evening. I think this Vera Wang (seriously, probably the only designer thing in my closet) blouse did the trick well. The blouse was a gift from my mother in law and I love it! Every time I wear it, I get compliments. I LOVE that blouse in Day 3! Such a cute outfit! I also love Day 4! I was coming to say exactly what Carrie said. Love the shirt on day 3 and the whole outfit on day 4! you look great!! Love the cinco de mayo outfit!! (and wow a party at Adam Corolla's that's amazing!!) The day 6 outfit was a great choice for a concert!! and as a former dancer, love the wrap dress!! I'm in So Cal too!! such crazy weather and I take it you're more LA/ Beaches, so you're getting slighty colder weather. I'm OC/ Inland Empire!! I love your top in day 2 and your shorts in day 4! the weather here has been killing me too. i barely picked anything warm, but i probably should have. my pictures are pretty awful. it's my least favorite part of this whole thing.